The perfect symbol has just come to mind! I’ve been racking my brain for ages and I got it, finally! I’ve been inspired! But where should I write it down, now that I’m sunbathing on the beach! Has something similar ever occurred to you? As a millennial the first thing I did was to look for an app that could help me in that situation. I opened Google Play and… Surprise! Nobody had created it yet! That’s how Cleopatra was born. Born from the daily needs of a future master student in conference interpreting. Though my journey at Pontifical University Comillas hadn’t as yet started, I had already chosen a subject for my MA Thesis. I fondly recall the moment I explained the idea to my MA thesis director, Lola Rodríguez Melchor. 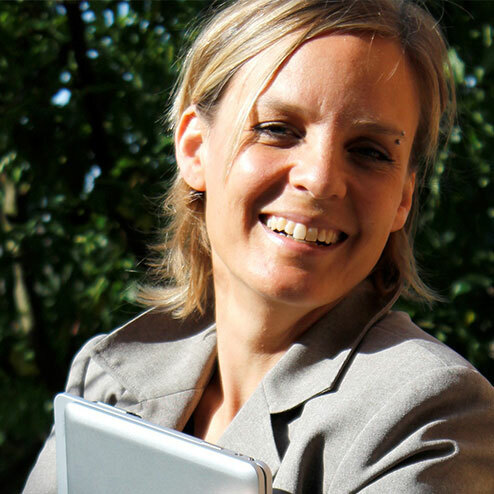 With something between curiosity and scepticism, she asked cautiously: “Do you know anything about how to develop smartphone apps?” I answered: “Well, not yet. But if I take into account the huge amount of apps on the market, I don’t see why I couldn’t create one. I don’t think that every creator of an app must be a genius.” Lola helped me a lot to outline my idea for Cleopatra and I’m deeply thankful to her. Whenever I cannot sleep, I usually listen to a SER Historia podcasts. On one of those sleepless nights, somebody was talking about Cleopatra and I thought to myself: Cle-o-pa-tra… what a wonderful sonority and what an elegant woman! I should take advantage of her name somehow in the future. Her name is well-known universally and any variation of it in other languages is minimal. While developing the idea for the app, I quickly connected the dots. Cleopatra was polyglot, as are many interpreters, and historically she is linked to hieroglyphs, stylized pictures containing information that is not readable by everybody, just like interpreters’ symbols! Cleopatra is the first smartphone app created for consecutive interpreting professionals. It has four main features: symbols storage, saved symbol checking, training mode, and a quiz. The user can store his or her triads here. A triad comprises a concept, a symbol, and an explanation for the symbol. You can define the concept and explain it in the dedicated space via the virtual keyboard, and you can draw the symbols with your finger on the virtual notepad. Easy, right? 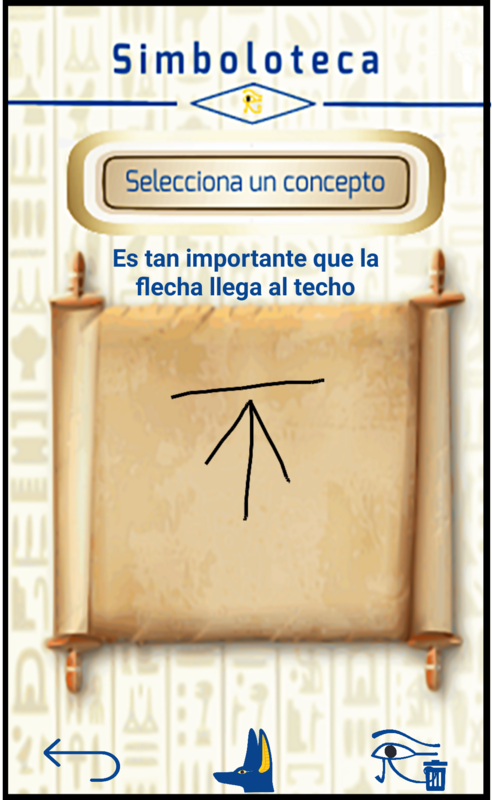 In order to look up a triad, users should tap on Selecciona un concepto. A list including all their saved concepts will appear. When selecting a concept, users will view what we see in this picture: in the upper-central part you can find the explanation of the symbol, and in the centre the symbols drawn by the interpreter for the chosen concept. 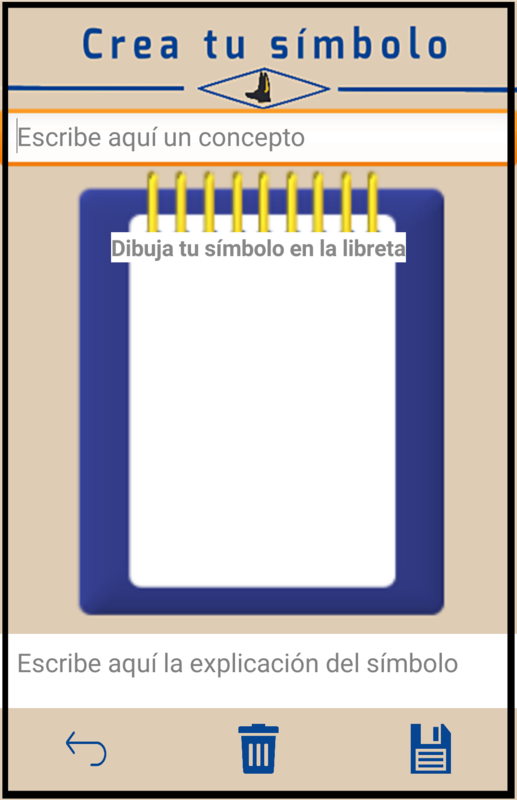 At the bottom of the screen, you see three icons: the first –– the back-to-menu button; the second–– a quick-access button to Crear Símbolo; and the third, with which users can delete either one triad or the whole library of symbols. This is the key feature of Cleopatra. Thanks to this feature, interpreters will be able to automate symbols and so, when needed, write or read them swiftly. Cleopatra has a stable academic basis and targets performance improvement during note-taking thanks to task decomposition and deliberate practice in symbol automation. According to Gile (1995, 159-195) mental energy is paramount for consecutive interpreters. It is only available in limited supply and where processing capacity is lower than required, saturation can trigger quality deterioration. Furthermore, in his Tightrope Hypothesis, Gile warns that interpreters often work too close to saturation point. In order to protect an interpreter’s mental energy flow, some tasks should be automated. Ericsson (2000-2001, 195-196) reveals that the secret to reaching expertise level in our field is practice, but it must be deliberate. It should be organised to improve specific aspects that guarantee the durability of the changes required. Cleopatra is also based on deliberate practice for automating one of the elements that shapes consecutive note-taking (symbols). Regarding task decomposition, Gillies (2013) published a book in which he provided isolated training exercises for the component elements constituting conference interpreting in order to attain a comprehensive improvement in all interpreting skills. Likewise, Gillies (2005, 6-8) adduces that the complexity in the first phase of consecutive interpreting requires a high demand of mental energy, for all mental operations are operating simultaneously. During the second phase, clarity in our notes is crucial because our processing capacity dedicated at decoding them depends on the notes. In order to protect our limited mental energy, we should learn how to perform the same tasks but consume less mental energy; we can attain this goal by automation. 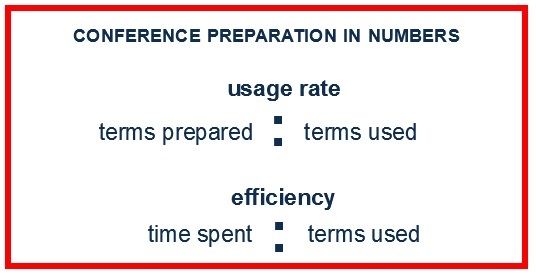 Gillies maintains that if we succeed in reducing the mental energy required for those tasks, by automating them, the time and energy spared could be invested in other tasks. He affirms that any attempt to reduce the efforts required in taking good notes will positively impact both phases of consecutive interpreting. To summarize: thanks to this easy and habit-forming game, interpreters will be able to train themselves to automate symbol with the aim of reducing their efforts during note-taking and note-reading. Consequently, they will be able to spare themselves, for they won’t have to think much about how to write what, and the energy they save can be invested in other tasks and/or of steering away from saturation point. Can you imagine a Trivial Pursuit specifically for interpreters? Cultura del intérprete is designed with this in mind. It is a quiz with three possible answers, only one of which is correct, about many important issues for interpreters. The questions relate to geopolitics, institutions, political personalities, economy, sports and so forth. Most of the questions are atemporal (where is the Gaza Strip located? ), but there are also questions about current circumstances (which country is currently holding the rotating Presidency at the Council of the EU?). With Cleopatra, interpreters can store their symbols in an organized way, whenever and wherever they want. Of course, jotting down symbols on a piece of paper is also useful, but I think it is now time to draw symbols on our smartphones for storage purposes. For those who like to play games in their spare time, what better way of enjoying it than by revising your out-dated symbols. 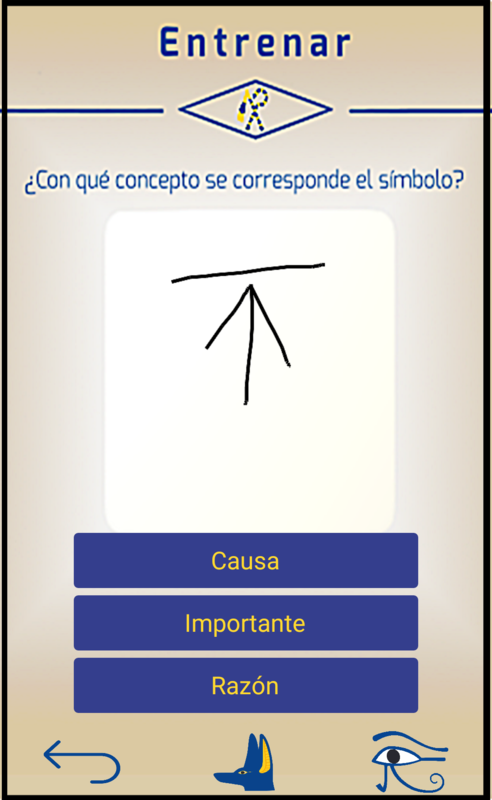 Cultura del intérprete quiz can be useful for users to learn or consolidate concepts and perhaps even to delve into the questions proposed autonomously. To date, the app has had a huge success, with already more than 200 Cleopatra sets in use around the globe. Stop noting your symbols on paper-napkins and download Cleopatra now! Currently, the app is just available for Android and costs only 0,99 €. In September 2017, I became an associate of Interpreters’ Help, and Cleopatra became part of IH. 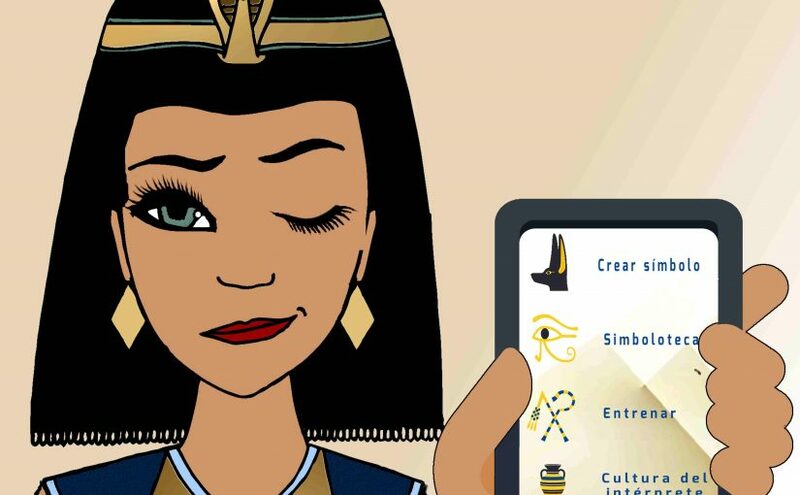 Soon Yann and Benoît (IH co-founders) will develop a version of Cleopatra for iOS. I’d like to take this opportunity given by Anja Rütten to introduce for the first time one of the next Interpreters’ Help features: The Symblary of Alexandria. 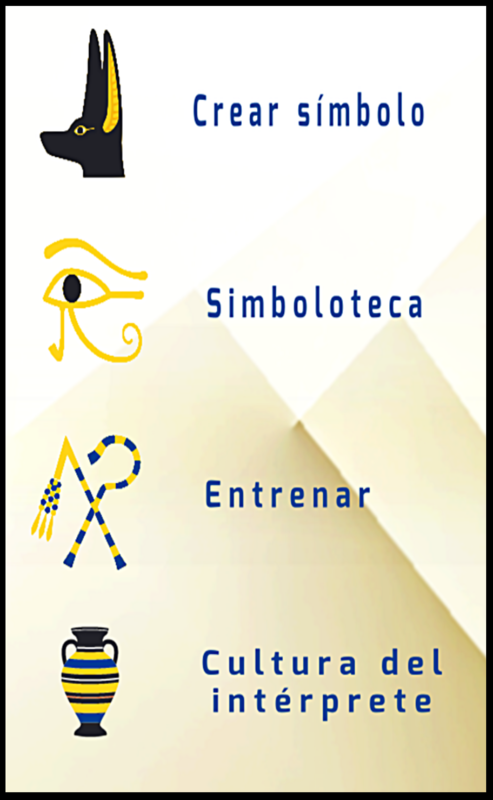 On this platform, Cleopatra and/or Interpreters’ Help users will be able to contribute to the community through their symbols. With this collaborative space, every time interpreters need inspiration, we will be able to access to the Symblary of Alexandria in order to consult what symbols other community members are using for a given concept. Great feature, isn’t it? For those who may not know, at IH we already have a similar concept with the Glossary Farm. It is a space where interpreters publish and share their glossaries. To sum up, I’d like to share with you this last picture on Cleopatra so that you know the meaning of Cleopatra’s icons. If you would like to download Cleopatra, or for further information about the app, please follow this link. ¡Se me acaba de ocurrir el símbolo perfecto! Llevaba muchísimo tiempo buscándolo y, por fin, he encontrado la inspiración, ¡a ver dónde lo apunto ahora que estoy tomando el sol en la playa! ¿Alguna vez te ha pasado algo parecido? ¡A mí también! y yo, como buena millennial, lo primero que hice ante tal situación fue buscar una aplicación que me solucionase la papeleta. Entré en Google Play y… ¡sorpresa, nadie la había creado aún! Así nació Cleopatra, de una necesidad cotidiana de una futura estudiante de máster de interpretación de conferencias. Mi andadura en la Universidad Pontificia de Comillas aún no había empezado y ya tenía escogido el tema para mi trabajo de fin de máster. Recuerdo, con mucho cariño, el momento en que le expliqué mi idea a Lola Rodríguez Melchor, mi directora del trabajo de fin de máster. Creo que con una mezcla de curiosidad y escepticismo, me preguntó cautamente: ¿pero tú sabes desarrollar aplicaciones? yo, básicamente, le contesté: bueno, aún no, pero habida cuenta de todas las apps que hay en el mercado, no sé porqué yo no podría crear una. No creo que todo el que haya creado una app sea un genio. Lola me ayudó muchísimo a perfilar mi idea de Cleopatra y le estoy muy agradecida. Cuando no puedo conciliar el sueño, suelo escuchar algún podcast de SER Historia y, en una de esas noches de insomnio, en mi programa de radio preferido se habló sobre Cleopatra. Enseguida pensé: Cleopatra, ¡qué sonoridad y qué elegante era esa mujer! Esto lo tengo que aprovechar de alguna manera. Ese nombre es mundialmente reconocido y su variación en otros idiomas es mínima. Así que cuando tuve la idea de crear la app, até cabos rápidamente. Resulta que Cleopatra era una mujer políglota, al igual que muchas intérpretes; además se le asocia a los jeroglíficos, que son dibujos que contienen información que no todo el mundo sabe interpretar, exactamente igual que nuestros símbolos. Cleopatra es la primera aplicación móvil creada para los profesionales de la interpretación consecutiva. Dispone de cuatro funciones principales: almacenamiento de símbolos, consulta de símbolos guardados, modo entrenamiento y juego de preguntas y respuestas. Aquí es donde el usuario puede registrar sus triadas. Una triada consiste en un concepto, un símbolo y una explicación de este último. El concepto y la explicación se deben escribir en los espacios habilitados con el teclado virtual y el símbolo se dibuja con el dedo sobre la libreta virtual. Fácil, ¿verdad? Para que el usuario pueda consultar una de sus triadas, primero, debe pulsar en Selecciona un concepto; después le aparecerá una lista con todos los conceptos que haya guardado y, al seleccionar uno de ellos, verá lo que se muestra en la imagen: en la zona central-superior queda representada la explicación del símbolo y en la parte central, el símbolo que el intérprete dibujó para el concepto previamente escogido. En la parte inferior de la pantalla, se aprecian tres iconos: el primero es para volver al menú de inicio, el segundo consiste en un botón de acceso rápido a Crear Símbolo y, mediante el tercero, el usuario puede borrar o bien una triada, o bien toda la Simboloteca. Esta es la función estrella de Cleopatra. Gracias a ella el intérprete podrá automatizar sus símbolos para que, a la hora de la verdad, los escriba y los lea a toda pastilla. Y no lo digo por decir, Cleopatra tiene una fundamentación académica bastante estable, a mi juicio. Con ella se pretende alcanzar una mejora del rendimiento en la toma de notas gracias a la descomposición de tareas y a la práctica deliberada en automatización de símbolos. Según Gile (1995, 159-195), la interpretación consecutiva es una disciplina en la que los recursos mentales del profesional desempeñan un papel primordial. Estos son finitos y cuando la capacidad de procesamiento disponible es inferior a la necesaria, se produce la saturación, lo que acarrea una pérdida de calidad en la prestación. Además, con su teoría de la cuerda floja, nos advierte de que el intérprete a menudo trabaja cerca de dicha saturación. Para poder salvaguardar el caudal de recursos mentales, con el fin de poder satisfacer las necesidades requeridas, determinadas tareas se pueden automatizar. Ericsson (2000-2001, 195-196), nos revela que el secreto para alcanzar el nivel experto en nuestro campo no es otro que la práctica y esta ha de ser deliberada. Además, debe orientarse a mejorar aspectos específicos que garanticen la durabilidad de los cambios alcanzados. Por otro lado, Cleopatra se basa en la práctica deliberada para automatizar uno de los elementos que conforman la toma de notas para consecutiva (los símbolos). Con respecto a la descomposición de tareas, Gillies (2013) ha publicado todo un libro en el que da a conocer ejercicios para entrenarse de forma aislada en los distintos elementos que forman la interpretación de conferencias y alcanzar, así, una mejora de la pericia interpretativa en su conjunto. Igualmente, Gillies (2005, 6-8) aduce que lo complejo de la primera fase de la consecutiva es que supone una gran demanda de recursos mentales, pues todas las operaciones se ejecutan a la vez. Por otro lado, durante la segunda fase, la claridad de las notas es crucial, ya que de ella depende la capacidad de procesamiento destinada a descifrarlas. Para proteger nuestros recursos mentales finitos, debemos aprender a desempeñar la misma tarea, pero consumiendo menos recursos mentales y eso se alcanza gracias a la automatización. El autor declara que si se consigue que dichas tareas requieran menos esfuerzo intelectual, por estar automatizadas, el tiempo y la capacidad se podrán emplear en otras tareas. Gillies concluye que cualquier reducción de esfuerzos que implique tomar buenas notas, tendrá efectos positivos en las dos fases de la interpretación consecutiva. En resumen: gracias a este sencillo y adictivo juego, el intérprete podrá entrenarse en la automatización de sus símbolos para poder reducir sus esfuerzos durante la toma de notas y la lectura de las mismas. Así, la energía que ahorra, al no tener que pensar demasiado cómo escribe qué, podrá invertirse en otros esfuerzos y alejarse de la saturación. ¿Te imaginas un trivial para intérpretes? Pues la Cultura del intérprete es algo parecido. Se trata de un juego de preguntas con tres posibles respuestas para poder estar al día de muchas de las cuestiones relevantes para los intérpretes. Geopolítica, instituciones, personalidades políticas, economía, deportes… las preguntas versan sobre todos esos temas. Normalmente se trata de preguntas que no cambian con el paso del tiempo (dónde se encuentra la franja de Gaza), pero hay algunas que sí son exclusivamente de actualidad (qué país ostenta la actual presidencia de turno del Consejo de la UE). Gracias a Cleopatra, el intérprete podrá guardar sus símbolos, de manera ordenada, donde quiera y cuando quiera. Creo que lo de apuntarse los símbolos en un hoja también es muy útil, pero ya va siendo hora de aprovechar nuestros teléfonos móviles para almacenar símbolos. Además, para aquellos que utilicen sus ratos muertos para echar una partida a un videojuego, ¿qué mejor que divertirse y refrescar los símbolos? Por su parte, las preguntas de la cultura del intérprete podrán servir al usuario para conocer o afianzar conceptos y quizá para profundizar de forma de autónoma sobre las cuestiones que se proponen. 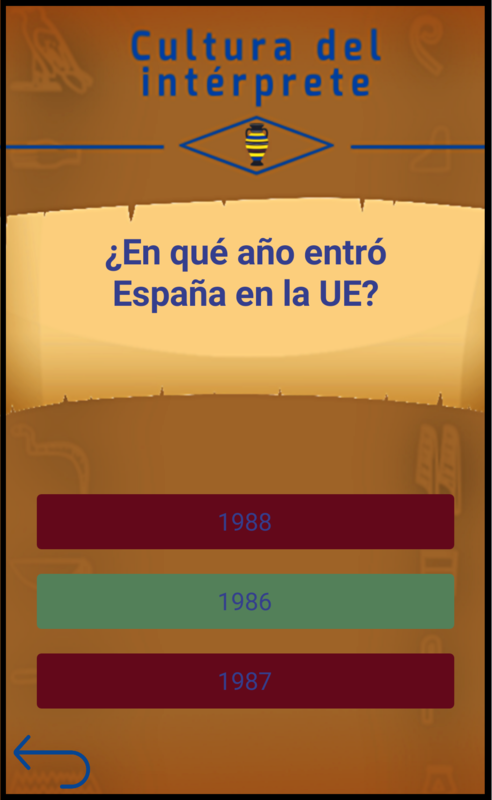 La app está teniendo mucho éxito, pues ya tenemos a más de 200 Cleopatrers repartidos por los cinco continentes. ¡Deja de escribir tus símbolos en servilletas y descárgate ya Cleopatra! De momento la app solo está disponible para Android y cuesta 0,99 €. En septiembre de 2017 me asocié con Interpreters‘ Help y Cleopatra ha pasado a ser uno de los activos de IH. Dentro de poco Yann y Benoît (los fundadores de IH) desarrollarán Cleopatra para iOS. Me gustaría aprovechar la oportunidad que Anja me brinda para desvelar en primicia una de las próximas funciones de Interpreters‘ Help: La Simboloteca de Alejandría. Se trata de una plataforma en la que los usuarios de Cleopatra y/o Interpreters‘ Help podrán contribuir a la comunidad mediante sus símbolos. Así, cuando los intérpretes necesitemos inspiración, podremos acceder a la Simboloteca de Alejandría para ver qué símbolos se utilizan en la comunidad para algún concepto que nos interese. ¿A que mola? Para terminar aquí os dejo una última imagen de Cleopatra para que sepáis el porqué de sus iconos. Para saber más sobre la app y para descargarla podéis encontrarla en este enlace.